Taipei, Feb. 21 (CNA) The Taiwan Pavilion, which attracted many visitors at the Shanghai World Expo in 2010, was officially opened to the public on Thursday in the northern city of Hsinchu, where it was rebuilt. 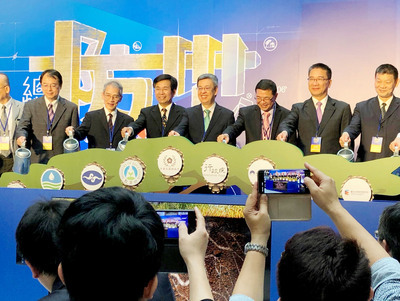 President Ma Yong-jeou, Hsinchu Mayor Hsu Ming-tsai and over 200 representatives from different sectors took part in the opening ceremony of the lantern-shaped pavilion, which attracted more than 700,000 visitors at the expo in China. Ma praised the mayor for insisting on rebuilding the pavilion in the city with the aim of promoting local tourism. The pavilion not only highlights Taiwan's cutting-edge technology, but also showcases some of its best natural and cultural attractions, including Sun Moon Lake, ceramics in Yingge, rocks from Jade Mountain and an infinity pool that symbolizes the Pacific Ocean. Pai Chung-chi, a Taiwanese businessman based in China who was helping to move the pavilion from Shanghai, said he hopes that government officials can display creative artworks at the pavilion to introduce Taiwan's rich culture to foreign visitors. The building, shaped like a sky lantern with a transparent exterior made of glass, was designed by prominent Taiwanese architect C.Y. Lee, who also designed Taipei 101, one of the tallest buildings in the world. The Taiwan Pavilion has received a record high of 11 marketing awards from home as well as abroad, including the Best Brand-Building Campaign-Globe Award in 2011 and MCEI World Marketing Excellence Award - Silver Medal for 2012.